Most people think all financial planners are “certified,” but that is not the case. Just about anyone can use the title “financial planner,” but only those who have fulfilled the rigorous training and requirements can call themselves a CERTIFIED FINANCIAL PLANNER™ Professional (CFP®). To earn CFP® certification, financial planners must meet education, examination, experience and ethics requirements. They must acquire several years of experience related to delivering financial planning services to clients and pass a comprehensive CFP® certification exam before they can earn their title. 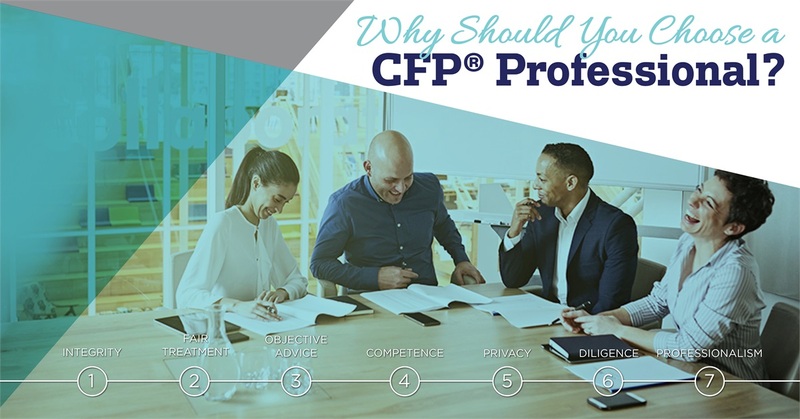 The CFP® title certifies that your financial planner has completed rigorous education and experience requirements designed to ensure competence in financial planning. CFP® professionals have practical financial planning knowledge, so you can count on them to help you create a realistic financial plan that fits your individual needs and put your interests ahead of their own at all times. Knowing what to expect from a financial planning relationship puts you in the driver’s seat—which is exactly where you belong. To get the most out of your experience with a financial planner, you shouldn’t settle for anything less than the qualities of a true CFP® professional. Our business model focuses on comprehensive financial planning services and unbiased investment advice through clearly outlined service options. We want you to feel confident in knowing that you are receiving the highest standard of financial planning services. We have the training, knowledge and fiduciary duty to act in your best interest. We are held to strict ethical standards to help ensure your financial planning recommendations are the right ones for you.